Light Grey Art Lab is a collaborative gallery and art events space that publishes limited edition works of art. I contribute to many of these projects through curation, creative direction, written content, and the graphic design. Below are some of the works we have published. A limited edition Tarot & Oracle Deck featuring the magic, mythology and metaphors of all 88 modern constellations and 22 astral and planetary bodies. An RPG themed battle card game where 2-4 players compete to take rein over the land of Vyk'Tornaahl. 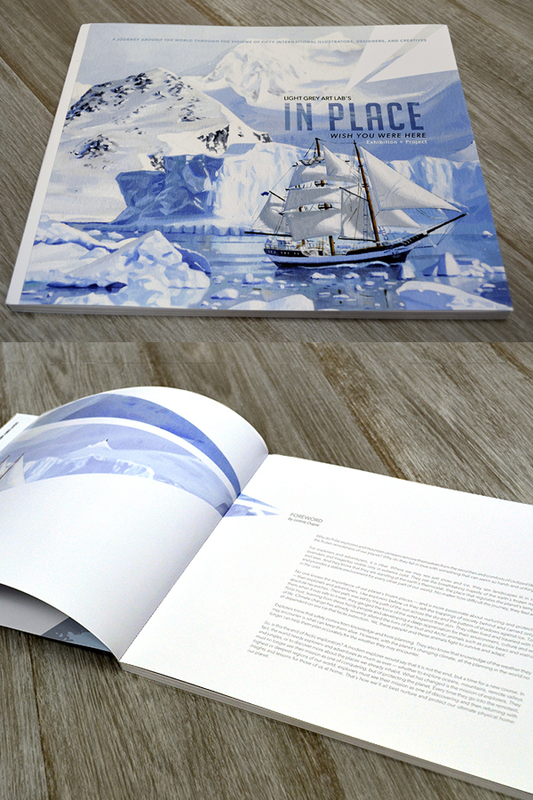 A Limited edition art book featuring the work from 50 international concept and visual development artists in a retrospective of the most intriguing places on Earth. A limited edition tarot deck featuring the work of 78 artists. In addition to the printed works through Light Grey Art Lab, I have been a curator of two large scale interactive game projects. Great Personality is a series of dating sims / visual novels based on the Myers Briggs Personality Types and features the collaborative works of 50 international artists and illustrators. My contribution was in curation, coding, graphic design and creation of additional assets, backgrounds and animations with the help of my Light Grey Art Lab colleagues Jenny Bookler and Francesca Buchko (editing), Chris Hajny (sound) and Becca Olene (additional assets). The first episode, Guadians, has been downloaded over 25,000 times and the next three episodes will be released throughout the next several years as free-to-play downloadable games. The run-time for this game is approximately 6 - 8 hours to complete all stories. View the game details here. Dream Arcade is an exhibition and interactive project that showcases the work of 30 international artists, each one developing the assets for a new 2d side-scrolling platformer. The exhibition debuted September 12, 2014 at Light Grey Art Lab and is free to play online. I worked alongside Chris Hajny (Light Grey Art Lab) and David Washington (Microsoft) to develop the visual language and graphic design for the project as well as assisting in the overarching story concept. Our team-mates Jenny Bookler and Francesca Buchko, with the help of Ian Gorton, are assisting in level design and additional assets. More details about this project and links to download the promotional mini games can be found on the Light Grey Art Lab Dream Arcade page here. The Light Grey Art Lab Podcast is a weekly show on a spectrum of topics related to the creative lifestyle. Each week we address a combination of topics spurred by artist interviews, roundtable discussions on practice and process, and more. The podcast started in January of 2013 and is produced by Chris Hajny. Discussions by Lindsay Nohl, Jenny Bookler, Chris Hajny, Francesca Buchko and visiting artists and creatives.